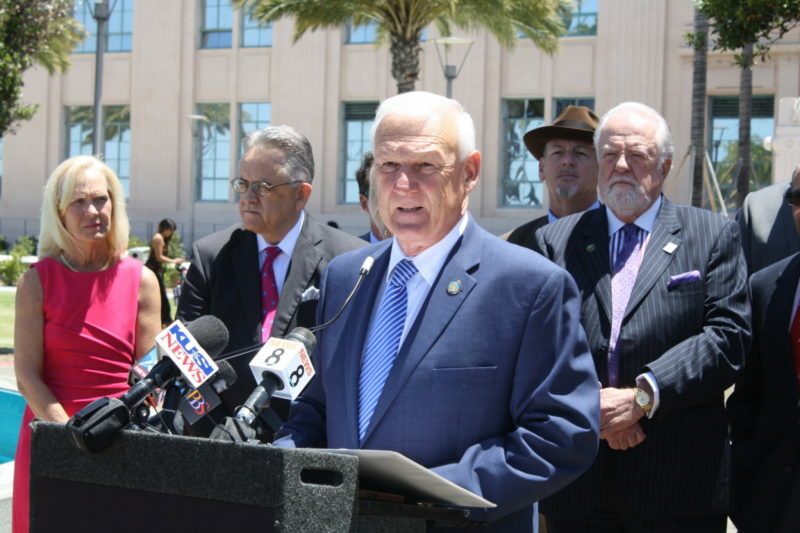 County Supervisor Ron Roberts recently lashed out at a homeless advocate who suggested the county could do more to help the crisis. To understand his reaction, it helps to understand the criticism – from both sides of the aisle – the county has faced over the past few years. Last Wednesday, after hearing yet another call for the county to do more to address homelessness, County Supervisor Ron Roberts decided he’d had enough. “Can I respond to that? I’m just about ready to jump out of my seat cause that is pure baloney,” Roberts said at a board meeting. The latest critic was John Brady of the Voices of Our City Choir, a group of homeless and formerly homeless San Diegans. Brady once lived on the street himself. Now he was standing before Roberts and other supervisors to comment on a county report on improving housing affordability. When Brady mentioned the county’s response to homelessness, it hit Roberts’ last nerve. Critical feedback from residents is not unusual at supervisors meetings — but Roberts’ reaction was. He repeatedly waved his index finger at Brady and raised his voice when Brady cut in or tried to apologize. Finally, after Roberts lectured Brady for more than a minute, board Chair Kristin Gaspar felt compelled to step in – she urged Roberts to allow Brady to sit down. Roberts’ blowup likely wasn’t just about Brady. In the hours before the meeting, Mayor Kevin Faulconer had urged the county to redouble its mental-health efforts. And for months, political candidates and Democrats have more harshly denounced the county’s response to mental-health and homelessness. After the meeting, Roberts had another pointed response to Assemblyman Todd Gloria, who had noted the county’s unspent mental health money in an exchange on Twitter. Roberts’ reaction explains the politics surrounding the heated battle to replace him. Roberts has represented the district that covers much of the city of San Diego for nearly 25 years. To understand Roberts’ reaction, you have to understand the avalanche of criticism the county’s taken the past couple years. Democrats like Nathan Fletcher, who hopes to replace Roberts on the Board of Supervisors, are essentially running against the county. They are calling for massive overhaul to the county’s long-held approach and essentially, a referendum on policies set by Republicans who have led the county for decades. Democrats, labor leaders and advocates have for years criticized the county for building up its reserve accounts and for not spending enough on social services, particularly efforts to combat homelessness. The homelessness and hepatitis A crises that hit the county the past couple years only fueled more intense criticism. County officials like Roberts have said they are doing more than ever to try to address those concerns. The county’s mental health budget jumped nearly a quarter this year. Supervisors have also unveiled new programs to aid homeless San Diegans, including the effort Roberts mentioned in his outburst, Project One for All, an effort to house 1,250 homeless San Diegans with serious mental illnesses, though the ambitious initiative has hit some snags along the way. “I think that (Roberts’) response reflected the frustration of all the focus that he’s put on [homelessness], all the money the county has put in, the true dedication of these staff people who are thinking about this 24/7 and who are out there on the streets,” said Tim McClain, a spokesman for Roberts. The recent criticism hasn’t just come from Democrats. Republicans like Faulconer and former District Attorney Bonnie Dumanis, who hopes to beat Fletcher in November, are trying to thread a needle: They don’t think they can directly criticize a county long led by their own party. But they also seem to have concluded that the county must change. Faulconer, in a string of tweets last week, said “the County MUST take a different approach with mental health” – after praising the county for budgeting hundreds of millions of dollars for mental-health. And at VOSD’s Politifest earlier this month, the mayor recently said he’d like to see the county help deliver more mental health beds, housing and services. He joked that the supervisors are “fine” when asked whether Republicans were to blame for not delivering ample mental-health services. Dumanis has been a little bolder on the campaign trail. She has said reforms are needed and wants to pull $100 million from the county’s ample reserve account each of the next four years to provide loans for low- and middle-income housing projects. “I want to be the change agent because I’ve been a change agent,” Dumanis said at the debate last week. But when I asked Dumanis to grade the county’s response to homelessness, she refused. She’s gone out of her way to avoid directly criticizing county leaders for months. She told me in May that she thinks she has the knowledge and relationships to successfully push for changes.